In Harmony, palettes are individual *.plt files that can be copied, transferred and stored. When a palette is created, it needs to be stored somewhere. Harmony is set on Basic Palette Lists mode which saves the palette at the Scene level. In Toon Boom Harmony, you can switch from Basic Palette Lists mode to Advanced Palette Lists mode which will allow you to choose the folder level you want to save your palette files to. Refer to the Creating a Colour Palette section to learn more on how to access these options. There are four locations where you can find Palette Library folders: Element, Scene, Job and Environment folders. • Element: The Palette Library folder is stored directly in the Drawing Element (Layer) folder. 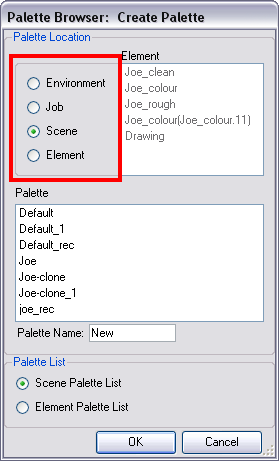 • Scene: The Palette Library folder is stored directly in the Scene folder. • Job: If you are working with Toon Boom Harmony as a stand alone version, the Palette Library folder is stored in a Job folder contained within the Scene folder. • Environment: If you are working with Toon Boom Harmony as a stand alone version, the Palette Library folder is stored in an Environment folder contained in the Scene folder. This existing structure is compatible with Toon Boom Harmony Server. Toon Boom Harmony’s database has a leveled structure starting from the Environment down to the Element. They have a client-server configuration that allows all data, such as palettes and scenes, to be shared between a series of client machines. In Toon Boom Harmony, you can switch from Basic Palette Lists Mode to Advanced Palette Lists Mode and choose the folder level you want to save your palette files to. Working with Harmony stand alone, the Element level is very useful when there are a lot of different palettes. When a colour model drawing is created, it is stored in its element folder. By storing the corresponding palette file with the colour model, the colourist is able to load them both from the same location. This also creates a more organized structure. Working with Toon Boom Harmony stand alone, a palette file can also be saved at the scene level so that all of the palettes from the scene are stored together. The palette naming will have to be structured so that the colourist or character builders can find the correct one. Saving the palettes at the scene level makes it very easy to backup the palettes and retrieve their location. The scene level can also be useful for Cut-out animation. Instead of creating a colour model scene that includes all of the characters, props, effects, and location, the colour palette or model will often be directly imported to, or created in, the character building scene. Just as with a Cut-out character building scene, each element uses the same palette so it would not be efficient to save the palette inside one element. Instead, it is saved at the scene level. This prevents a palette overload because all of the models are in different scenes. It also allows each scene its own set of palettes corresponding to its model. When working on a cut-out animation production, it is highly recommended to work with the Scene level.